Yesterday in the early afternoon I received a somewhat cryptic email from The Yarn Harlot. A quick peek at her blog confirmed my suspicions; she had written an entire post about me and my work. Believe me when I say that this is incredibly flattering and more than a little surreal. I still remember the days before I knew how to knit -- when my knitting friends told me about this Harlot-lady from Toronto with a knitting blog. Last winter I found out that she knew who I was and that she liked what I did. In March I heard her read and got to meet her (she snuck up on me.) And now this. Thank you, Steph. I'm already lining up a slew of nice pubs to take you to the next time you're in town. So, to all the newcomers and the oldcomers and to those who have known me since before the beginning began, Welcome. Let's see what's around the bend, shall we? January 8, 2011 at 5:21 p.m. I was so excited for you when I read your post! January 8, 2011 at 5:31 p.m. Very cool! The Mittens With Pints On would be a perfect knit for my husband. The socks would, too. And the flamingo mittens would be perfect for my sister-in-law. Your designs are gorgeous and the beer mittens remind me of some of Rennie Mackintosh's designs or other Arts & Crafts designs. Very clean lines. January 8, 2011 at 5:49 p.m.
January 8, 2011 at 6:13 p.m. I'm glad she had the post or I might have never seen your awesome mitts. January 8, 2011 at 6:37 p.m.
Yep, I'm a newcomer to your blog because of that post. Have added you to my blog list as I'm sure tons of others have done. Hang on to your mittens, I suspect things are going to start getting busy! Love those mittens, so glad to have found you. January 8, 2011 at 6:42 p.m.
January 8, 2011 at 7:03 p.m.
January 8, 2011 at 7:06 p.m. I just came to your site from the Yarn Harlot. She is right. Your mittens are awesome. I will have to become a better knitter so I can make some of your mittens too. I read you both and was so excited to see you held in such high regard by The Harlot. What fun! January 8, 2011 at 7:49 p.m.
Hey, I knew (about) you when...Congratulations for your mention on the Yarn Harlot! What a rave! January 8, 2011 at 8:16 p.m. I'm so glad she mentioned you, too!!! That's how I got to your site and I LOVE your designs!!!! I added you, though I have been here before, she made me. January 8, 2011 at 8:17 p.m. When I read the harlot's post about you, I cheered. I'm so happy you got the recognition for your lovely mittens! January 8, 2011 at 8:43 p.m. I've been a longtime fan of yours, and I was so happy to see the Harlot's post about you! Congrats on your newfound fame! You deserve it! January 8, 2011 at 10:37 p.m. I found you from the post on Yarn Harlot so I am one of the new fans. I love your mittens..and had to order 3 of your patterns right away..can hardly wait to cast on for the feathered friends mittens. Your stuff is awesome...I can see why STephanie is obsessed!!!!Congrats! January 9, 2011 at 1:23 a.m.
Penguins? Think you want to design some penguin mittens? Please? I adore your work! January 9, 2011 at 3:21 a.m. Newcomer here! Your mitts are GORGEOUS! I'm so glad Stephanie posted that entry. January 9, 2011 at 7:00 a.m. I just learned of you recently from a podcast by Knitpicks (I believe) and now you are mentioned on the yarn harlot. That's something else, isn't it? You deserve it, of course. Your designs are just smashing. January 9, 2011 at 7:06 a.m. I was so tickled for you when I saw Stephanie's post! 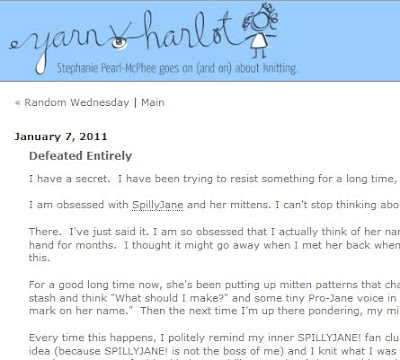 January 9, 2011 at 8:39 a.m.
My intro to SPILLYJANE! has come via the YarnHarlot, my curiosity piqued via the beer mittens, and knowledge of flamingo mittens via comments here. I'm almost afraid to keep reading. Congrats on the Harlot mention. January 9, 2011 at 9:41 a.m.
Congrats to you! A well deserved light upon your wonderful designs. January 9, 2011 at 10:43 a.m.
January 9, 2011 at 11:58 a.m.
Hurrah for you. I love your mittens too. I always knew the harlot had great taste. January 9, 2011 at 12:12 p.m. I was so delighted to find your website from Ms. McPhees link. Love your designs. January 9, 2011 at 2:30 p.m. Congratulations!!! You design fantastic mittens and we love your involvement with NaKniMitMo. Thank you for all the wonderful patterns, past and future! January 9, 2011 at 2:38 p.m.
Haha, thanks for the welcome. I've been following the Harlot myself for a little around a year and it was her post yesterday which lead me to your blog. I love your work! It's amazing! Thanks for the welcome! January 9, 2011 at 3:31 p.m.
January 9, 2011 at 3:56 p.m.
Hi. 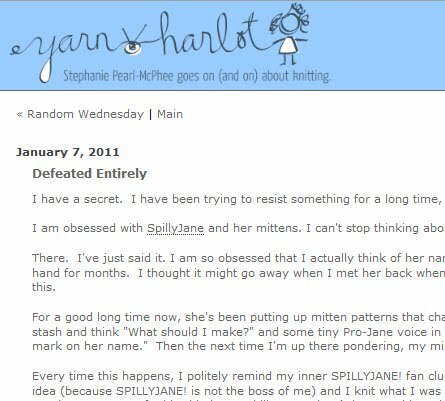 I, too, found your blog thanks to the Yarn Harlot. LOVE your stuff. I aspire to do your kind of knitting. I especially am enchanted :) by the gnome socks/mittens. Actually, I am smitten with them. January 9, 2011 at 4:05 p.m.
Congrats! I was reading the Yarn Harlot post late last night on my Blackberry when I couldn't sleep. I clicked on the spillyjane link and WOW! - instantly smitten with your mittens and your blog. Love your designs and your fun way with words! I Will be following you and am more determined than ever to knit my first pair of mittens and keep on goin! Thanks for the blog and the incredible designs - just love them! Any advice on what mitten pattern to try as my first mitten?? January 9, 2011 at 8:03 p.m.
Just read it. What a nice post on you. That rocks! January 10, 2011 at 7:05 a.m. I am new and I just bought two patterns: gnome mittens and beer socks. I know that Stephanie Pearl-McPhee can bring a huge amount of attention to patterns and/or designers, but I believe she always sends her readers in a good direction. I am delighted to have found your patterns, and I hope a jillion others find them also! January 10, 2011 at 10:23 a.m. I read her column and thought it was so nice! Congratulations, you are a fabulous designer! Which reminds me, if I haven't already favorited you on Ravelry, I need to do that. January 10, 2011 at 11:30 a.m.
January 10, 2011 at 12:22 p.m.
January 10, 2011 at 12:40 p.m.
January 10, 2011 at 5:44 p.m.